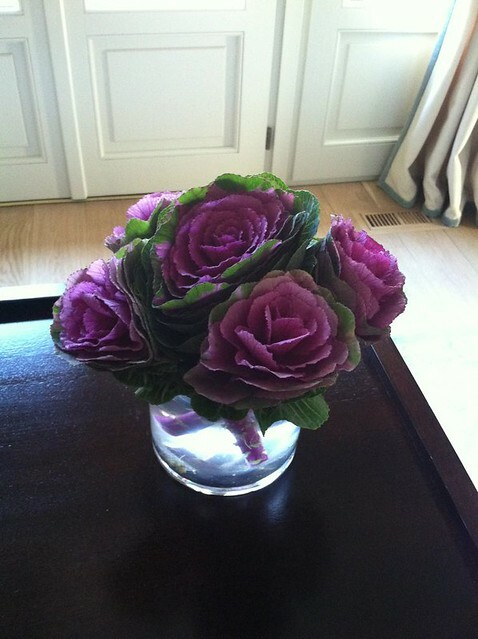 I have been noticing more and more flower arrangements using ornamental kale. It first started with this beautiful arrangement seen in Atlanta Homes & Lifestyles last fall, in an article featuring a soiree at Suzanne Kasler’s house. 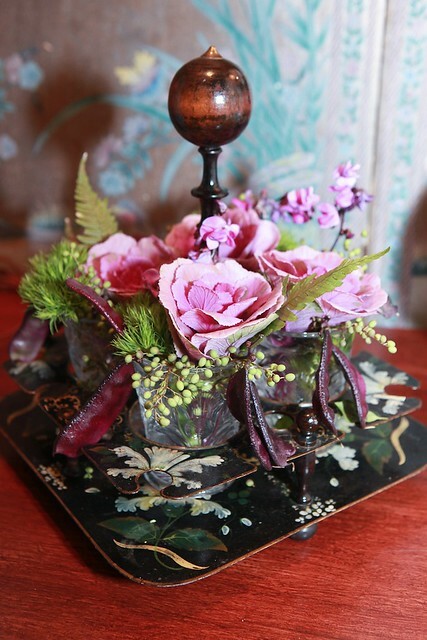 The flowers were styled by Suzanne Kasler Interiors designer Keith Arnold. 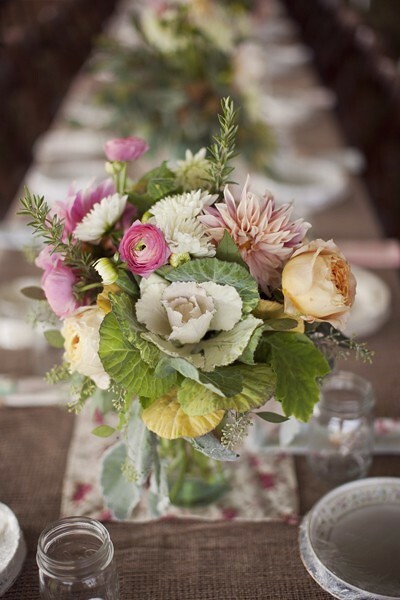 Small clusters of ornamental kale mixed with other flowers decorated some of the tables at the event. I spied a beautiful ornamental kale arrangement at the Horsley Kaufman pillow launch event; Margaret Kaufman, one of the owners, noted that she uses ornamental kale frequently in her own fall and winter house décor. I recently found some ornamental kale at Whole Foods, and bought a small bunch. I have absolutely no skill whatsoever at flower arranging, and this was the best I could do – I arranged the stalks in a simple vase. However, I enjoyed the purple and green color scheme in my family room for a few days (surprisingly, they didn’t last very long). 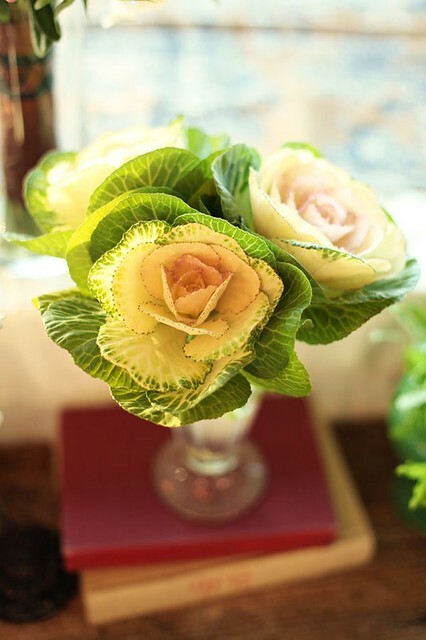 Quite a few of the rooms styled for Suzanne Kasler’s wonderful new book, Timeless Style, have ornamental kale in the arrangements. 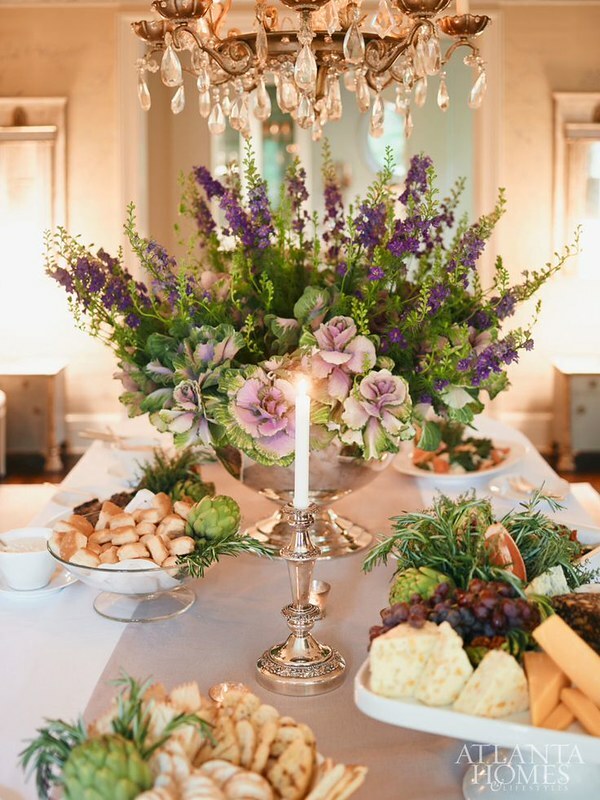 This picture is from Sizanne’s own kitchen – the deep purples and greens of the flower arrangement play off the purple linen on the chairs and the barstools (not pictured). 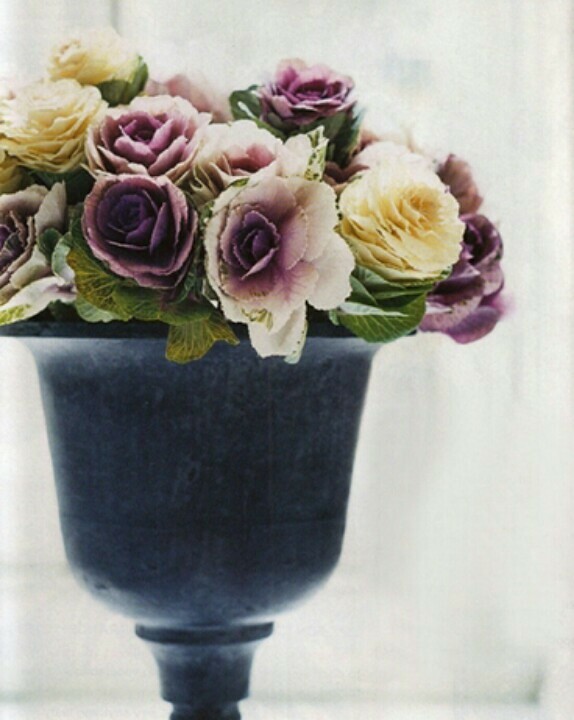 As a side note, if you own Timeless Style, go through it and only focus on the flowers – Suzanne Kasler and team use the most incredible flower arrangements in this book, from the very simple to the very ornate. Another kitchen featured in Timeless Style, with a pretty arrangement that includes ornamental kale. 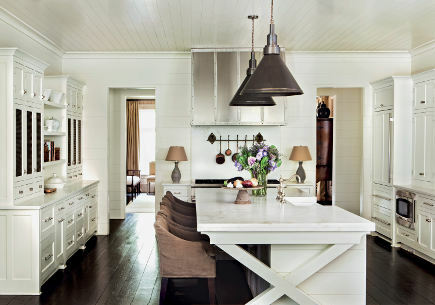 A Suzanne Kasler designed kitchen featured in Southern Living had a nice bunch of ornamental kale on the kitchen counter. 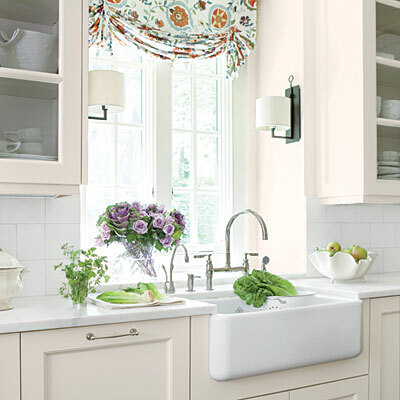 The casual and organic feel of ornamental kale lends itself well to the kitchen, don’t you think? 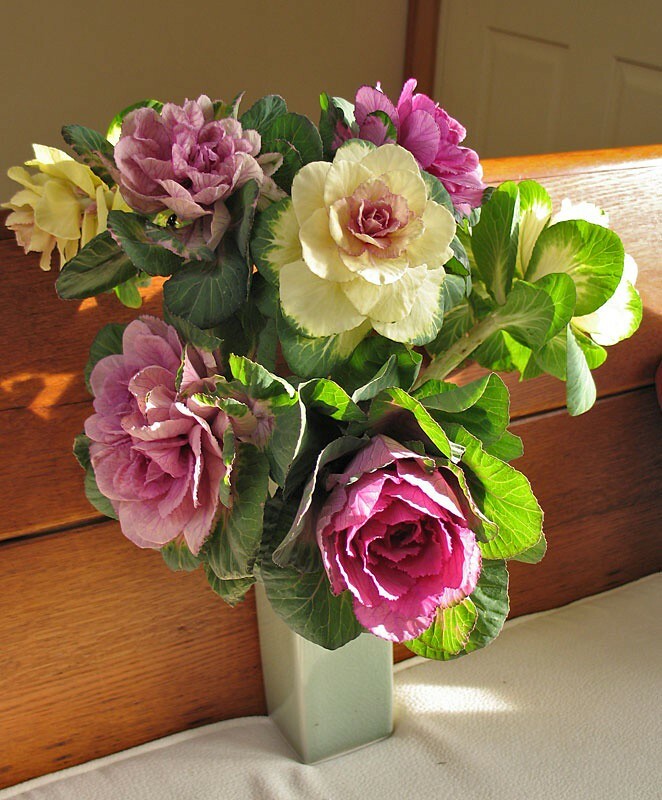 A close-up of the sink from the same kitchen gives a better view of the ornamental kale bouquet. 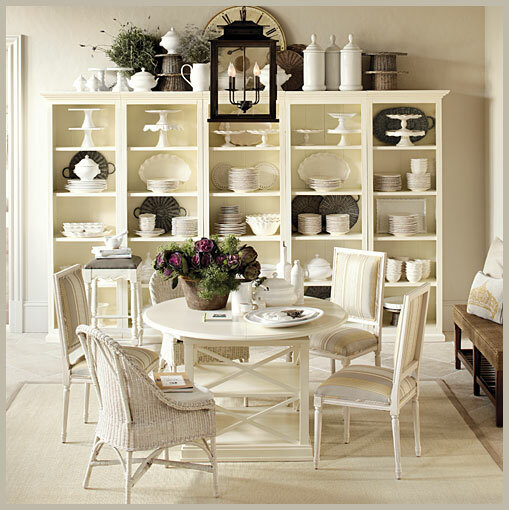 An old Ballard Designs ad has a pot of ornamental kale on the table. I wonder if these are planted with the root – if so, it would make a long lasting arrangement. A beautiful arrangement in an urn. Image source. 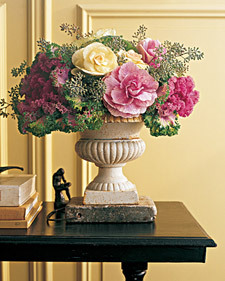 Another ornamental kale arrangement in an urn, found on Pinterest. White ornamental kale is part of this seasonal arrangement, seen in Veranda recently. 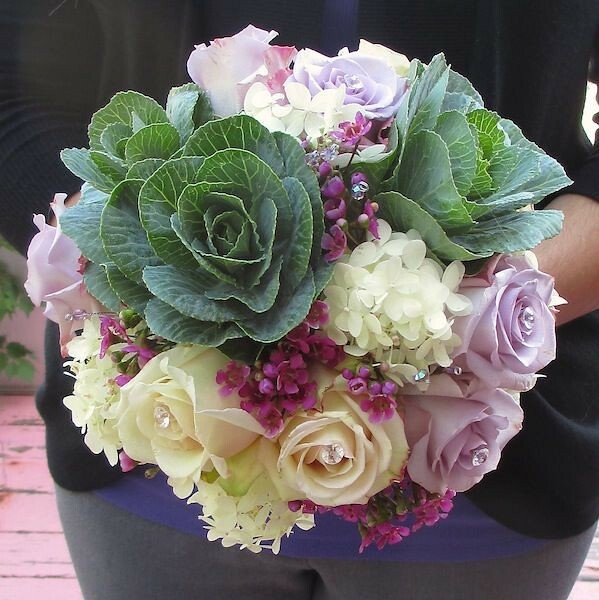 Pinterest is full of the most gorgeous ornamental kale pictures – in planters, flower arrangements, and even bouquets. This is a beautiful bouquet, isn’t it? 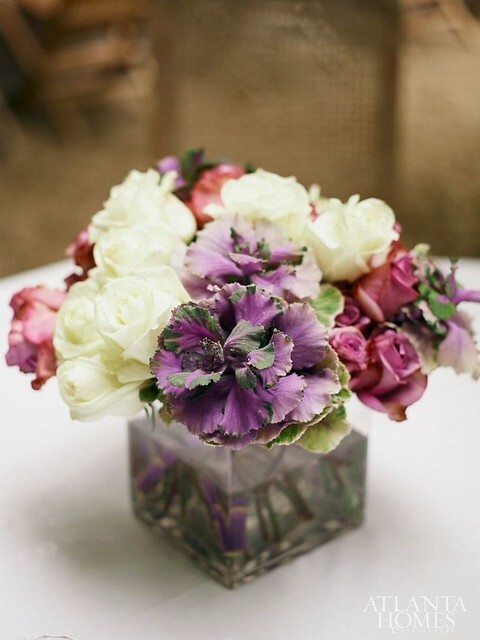 The combination of green, purple, and white, and the different textures and forms of the flowers is incredible. Three perfect specimens, simply arranged in a bud vase. 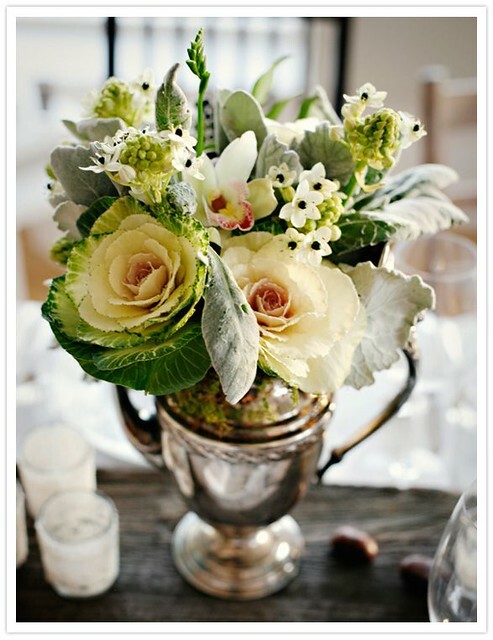 A beautiful green and white arrangement. White ornamental kale mixed with other flowers. The white and the purple ornamental kale together is especially pretty. What do you think of ornamental kale? Have you ever used it in your décor, either inside or out? Thank you for sharing these arrangements, Holly. I will see if I can find some at our Whole Foods. What a beautiful blog post Holly. I love this idea. It's very soft and fresh which makes a great transaction from the leaves to the flowers. I also absolutely love the colors in all of these image and want to do some paintings inspired by this palette. It has that lavender meets eucalyptus feel. We love kale as an accent in our bouquets and outside in our winter planters. But it's best sauteed in olive oil with a bit of crushed garlic! It's beautiful, isn't it? Love it! I've seen it at Whole Foods too! I decided to pass since we're moving soon! Hopefully I can find it after we move! I would love to plant some around a boxwood! Beautiful post!! I would love to have some of those arrangements around my 365 days a year!! i've never like it -it seems too 'foodie' to me! Beautiful post Holly! And most welcome after the snowstorm and frigid air here in New York. BTW, I have a son named "Cale." Cale is Caleb without the b. (well, duh) And yeah... he's often mistaken for the vegetable, but he makes jokes about it too... Like "I'm going to come and kelp you." goof ball!